The name Dunedin itself is of course derived from Edinburgh, the capital of Scotland, the two cities having been officially twinned since 1974. Founded by the Presbyterian Free Church of Scotland in 1848, the city has retained much of its Scots heritage, as this article demonstrates. Of the names of Greater Dunedin's 78 suburbs, 39 (50.0%) can be found in Scotland or are connected with Scotland in other ways, such as family names. Of course, some of the names are used in other parts of the British Isles as well, but most of them (43.6 %) are unique to Scotland or are readily identifiable with places in Scotland that are based on the same names. 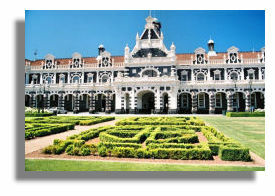 The picture here is of Dunedin Railway Station, New Zealand, via Wikipedia. 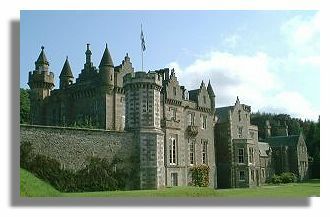 Abbotsford (Scottish Borders - the residence of Sir Walter Scott - illustrated here) though there is also an Abbotsford in West Sussex, England. The Dunedin suburb was actually named for Edward Abbot, Surveyor. Andersons Bay - named for the Anderson family, pioneers of the 1840s. Anderson is the Lowland form of MacAndrew, a sept of the Clan Chattan. Belleknowes - probably a made up name using the Scots word for a small, rounded hill or knoll combined with a French word; if so, then its intended meaning would be "beautiful little rounded hills". Broad Bay (Isle of Lewis, Outer Hebrides - in Scotland this bay is now also known by its official Gaelic name "Loch a Tuath"). Dymock (1994) considers this to be a purely geographical name. It is nevertheless still worth speculating that the choice of name may have been inspired perhaps, in part, by the well-known Hebridean water feature, particularly since the name occurs only in Scotland and not in other parts of the British Isles. Burnside (two places in Angus and one place in each of Fife, Moray, South Lanarkshire and West Lothian). According to Dymock (1994) the suburb takes its name from a farm in the area. One nevertheless wonders whether the inspiration for the name was the desire to commemorate the Rev. Thomas Burns, the spiritual leader of the first party of settlers in 1848, or Robert Burns the poet, to whom the Rev. Burns was related. 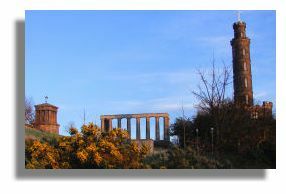 Calton Hill - a reference no doubt to Calton Hill at the eastern end of Princes Street in Edinburgh - see picture here. Challis - there is a village on Whalsay in the Shetland Islands called Challister. Clyde Hill - the name of this suburb no doubt refers to the river Clyde, which flows through Glasgow. Corstorphine (City of Edinburgh). It may interest readers to learn that Corstorphine is pronounced differently in the two cities. In Dunedin it is pronounced COR-stafeen, with the accent on the first syllable. The Edinburgh pronunciation is Ks-TOR-fin, the accent being on the second syllable, with the vowel in the first syllable being eliminated almost completely. Streets in this Dunedin suburb are mainly named after other districts of Edinburgh such as Clermiston, Gilmerton and Cramond (though spelt Crammond in Dunedin). Dalmore (Angus, Argyll & Bute, Highland and South Ayrshire). Dunedin (the Gaelic form of Edinburgh, derived from the original Old Welsh/Cumbrian name 'Din Eidyn' - 'Eidyn's fortress') and North and South Dunedin by association. Glenleith (Glenleith Burn and Fell, Dumfries & Galloway) but referring in this instance to Leith or Water of Leith in Edinburgh. Helensburgh (Argyll & Bute - see illustration). 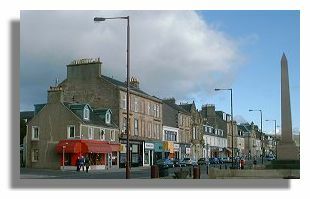 Helensburgh is one of Scotland's 'newest' towns, founded in 1776 and named after Lady Helen Sutherland. Janefield (Aberdeenshire, near Aberchirder and Highland, near Fortrose). Kinmont Park - there is a Kinmonth in Perth & Kinross. However, there are also places called Kinmont Beck and Kinmont Buck Barrow just over the border in Cumbria. This suburb, despite its spelling, is more likely to recall Scotland than Cumbria since all its streets have Scottish names. Leith Valley - Leith is a district of Edinburgh. Liberton (a district of Edinburgh). Macandrew Bay - although there is no place in Scotland by this name, a direct or indirect connection with Scotland seems a certainty. MacAndrew is a sept of Clan Chattan, the Gaelic form of the name being Mac Andreis. The Dunedin suburb was named for James Macandrew, Superintendent of Otago Province in 1859-1861 and again in 1867-1876. Maryhill (City of Glasgow). The Wikipedia article on Dunedin suburbs states that Maryhill does indeed take its name from the district in the city of Glasgow. Mosgiel (East Ayrshire, spelt Mossgiel). This town, on the western outskirts of Dunedin, was apparently named for the Scots poet Robert Burns' farm in Ayrshire. The Encyclopaedia of Australia, New Zealand and Papua-New Guinea, 1965, p. 211 provides the following explanation: "Mosgiel, named after a Scottish farm owned by Robert Burns, was so called by the poet's great-nephew, Arthur Burns, the son of Dunedin's Dr Thomas Burns." Portobello (City of Edinburgh, Dumfries & Galloway and East Lothian) also in England and Wales. New Zealand historians attribute the name to the district in Edinburgh (illustrated above) rather than the district in Wolverhampton, Newcastle-upon-Tyne or any of the other numerous places in Britain. The name of the Edinburgh district commemorates the capture of Portobelo, Panama by Admiral Vernon in 1739 (now acknowledged to have been an act of 'piracy' to prevent the Spanish colony from prospering). Port Chalmers - there is a water feature in the Orkney Islands called Chalmers Hope, Chalmers Slack in Moray and Chalmerston in East Ayrshire and Stirling. Port Chalmers was the only European settlement in the area before Dunedin was established and was named for Dr Thomas Chalmers, a leader of the Free Church of Scotland at the time the Otago settlers sailed. (Dymock, 1994, p. 105). Roseneath - Rosneath in Argyll can also be spelt Roseneath. Roslyn (Midlothian, spelt Roslin and Rosslyn Castle, also in Midlothian - the name comes from Gaelic and means "point of the waterfall"). Roslin/Rosslyn was the village made famous in Sir Walter Scott's Lay of the Last Minstrel. Rosslyn Chapel (seen here) is an ornately carved 15th century chapel which is said to have carving of maize which supposedly 'proves' that Henry St Clair, Earl of Roslin, visited North America a hundred years before Columbus. Shiel Hill (Dumfries & Galloway and South Ayrshire). St Clair and St Clair Park - the origin of the name of these suburbs is uncertain. 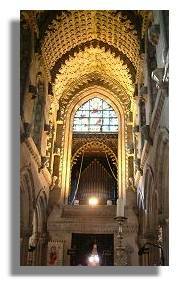 The favoured explanation is that they recall Henry St Clair (Sinclair), Earl of Roslin, who founded Roslin Chapel near Edinburgh in 1446 - see illustration. St Kilda (Western Isles). According to the Penguin Dictionary of British Place Names (2003) the name of this remote island derives from an old Norse word 'skildar' meaning 'shields', creating a bogus 'saint' in the process of its anglicisation. The Dunedin suburb appears to have been named after the one in Melbourne, Australia (which in turn was named after a yacht). Waverley (Waverley railway station, Edinburgh and one of Sir Walter Scott's novels) but also several places in England, including Waverley Abbey in Surrey. In Dunedin's case, as in many other cities around the world which have a district called Waverley, the origin of the name is highly likely to be Scottish rather than English. Dymock (1994, p. 152), however, suggests that the name originates from a crude, 'wavy' bridge in early settlement days. Brockville - there is a small settlement called Brock in Argyll & Bute as well as one in Lancashire, England. There are also many other places, however, throughout both England and Scotland with Brock as an element in the name. Carey Bay (Carey in Perth & Kinross) though Carey is found even more frequently in south-west England and is also an Irish surname. The suburb was named for an early settler, David Carey, whose cultural heritage has not been reported. Fairfield (Clackmannanshire, Shetland Islands and Stirling) even more commonly found throughout England and is also found in Ireland. Green Island (Highland) also the name of three places in south-western England, including one on the Isles of Scilly. The actual origin of the name appears to be neither Scottish nor English since, according to Dymock (1994, p. 40), the suburb takes its name from Green River, an early name for the local waterway, Kaikorai Stream. St Leonards (Borders, Edinburgh and Glasgow) also throughout southern England. According to Reed (1975), the Dunedin suburb was named for St-Leonards-on-Sea, a once fashionable seaside resort in Hastings, Sussex. An early settler, David Carey (see Carey Bay above) chose the name to honour his wife's birthplace. There is therefore no connection with Scotland in this instance. The strong Scottish influence on the development of Dunedin is further attested by the names of several parks, reserves and golf courses in and around the city such as Balmacewan Golf Course, Bathgate Park, Bethune's Gully, Burns Park Scenic Reserve, Chisholm Park Golf Course, Frasers Gully, Glenfalloch, Leith Valley Scenic Reserve, Logan Park, Mount Cargill Scenic Reserve, Ross Creek, St Clair Golf Course and Woodhaugh Gardens. Another reminder of Dunedin's close connection with Scotland and with Edinburgh in particular is the name given to the creek to the immediate north of the city centre - Water of Leith. 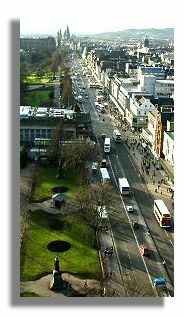 In fact, so close is the link with Edinburgh that two of the main roads through the city centre, Princes Street (the Edinburgh original is seen here) and George Street, recall their namesakes in Edinburgh. These thoroughfares bisect Moray Place (another name from Edinburgh) and the Octagon (with its statue of Robert Burns) in the very heart of Dunedin. Even a cursory glance at a street map of Dunedin demonstrates just how Scottish is this city, with easily around 30% to 40% of its city and suburban streets bearing Scottish names. In the city centre alone, the list of streets with Scottish names includes Albany Street, Canongate, Cargill Street, Clyde Street, Crawford Street, Drummond Street, Dunbar Street, Duncan Street, Dundas Street, Forth Street, Grant Street, Leith Street, Logan Street, MacLaggan Street, McMillan Street, Rattray Street, Scotland Street, St Andrew Street, Stuart Street and Sutherland Street, in addition to Princes Street, George Street and Moray Place already mentioned. Dunedin celebrates its Scots roots by staging a Scottish Week every September. Dunedin is highly likely to be the only city in the world outside of Scotland where around 50% of the suburbs have names that can also be found in Scotland. This is an enduring legacy of the pivotal role that Scots settlers played in the establishment of Dunedin in 1848 and in its subsequent development to become New Zealand's fourth largest city- see First Scots in New Zealand. Gil Dymock (compiler) (1994). AA Concise Dictionary of New Zealand Place Names (Moa Beckett Publishers Ltd, Auckland). Reed, A.W. (1975). Place Names of New Zealand (A.H. and A.W. Reed, Wellington). Room, A. (2003). The Penguin Dictionary of British Place Names (Penguin Books, London). The Encyclopaedia of Australia, New Zealand and Papua-New Guinea (1965). (Renbar Pty Ltd, Sydney.). Wikipedia article on Suburbs of Dunedin. Greater Dunedin Street Map, 1998 (New Zealand Automobile Association Inc.). Dunedin City Pocket Map, 18th Edition, not dated (Kiwimaps Ltd, Christchurch).